Compare paint in New Zealand at Canstar Blue. Resene, Wattyl, British Paints, Dulux and Valspar were compared on quality of finish, durability, ease of application, value for money, range of finishes and overall satisfaction. There’s no denying painting can be a fun project, whether it be memorable family bonding or a therapeutic activity, stripping away the stresses of life. Painting your own house can definitely be a better choice, if you play your cards right. Along with the satisfaction, it is cheaper than hiring a professional, you’re in control of the process and, better yet, you can choose when and how often you do it. Let’s just say, your rainy days don’t have to just be consumed by Netflix. But, the large array of paint options comes with a corresponding room for error. 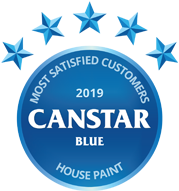 Canstar Blue has canvassed the opinions of 958 Kiwis to make sure you don’t make the same mistakes they did, or on a more positive note, replicate their dream paint jobs on your humble abode. We asked them about the paint they used in the last three years, to get their response on a range of factors, including the paint’s quality, durability and ease of use. Resene knocks it out of the park, winning 5 stars for overall satisfaction. They furthered this win with a smooth 5 stars for quality of finish, durability, ease of application, value for money and range of finishes. Three other 5 stars were recognised, Wattyl for ease of application and both British Paints and Valspar for value for money. So, if you’re wanting to go for a tried and tested paint spanning all areas and satisfying customers just like you, Resene is a customer favourite. 81% of those surveyed said they paint their houses because it is cheaper than hiring a professional, and 43% said they painted because they enjoy it. 63% use sample pots before deciding on a colour. 36% buy new brushes instead of cleaning old ones. 42% say they are unsure how to dispose of old brushes. Should you prep before painting? Repairing damage to your house before giving it a fresh lick of paint is definitely the easier and cheaper option. If you decide to shove the damages under the rug to worry about at a later date, you may encounter further problems. Some repairing jobs are bound to damage the wall and therefore the paint, which means you will need to prepare and repaint again. This comes with the dreaded cost, stress and time. So, if you have the money now, it’s better to make repairs before painting. Smoothing walls down creates an even surface when the paint has dried which is more aesthetically appealing, unless, of course, you’re wanting a rustic look. Depending on the surface, it may need to be sanded down, have caulk removed or fresh plastering. Although it may cost you a small amount for resources or to hire a professional, it’s most definitely cheaper than finishing the paint job and having to redo it. Priming essentially is the first coat or base before painting which adheres the paint to the wall, preventing the paint soaking into the wall. Primer minimises the amount of flaking and wear in the future. So, as you guessed it, it means less painting and less money down the line. There are also additional cost-saving benefits. After priming, less coats are required to achieve a smooth finish. And, when changing a dark colour to a lighter choice, primer creates ease of application and may save you from applying a second or third lick of paint. Otherwise known as caulking, filling seams uses a material called caulk to fill in gaps on surfaces. As it suggests, filling seams guarantees a seamless finish when it comes to painting. If colours and techniques go to plan, you’re going to end up with a painted wall pleasing the eye for years to come. It’s usually better to caulk after priming as the white primer base will highlight the seams and therefore give you a better guide to fill all of them. Also, primer sticks to the surface whereas caulk doesn’t do so well. If the original surface is of good condition and the fresh coat is the same or a similar colour to the old, you may only need one coat. Whereas, some colours may require four to five coats which of course means a lot more coin. Darker coloured paint also tends to need a repaint more often, so keep this in mind. Test pots can help you distinguish how many coats you need and guarantee you’ll get that timeless look you’re after. No one wants to repaint a room to find out they really aren’t feeling it. Canstar Blue surveyed 2,500 New Zealand consumers across a range of categories to measure and track customer satisfaction, via ISO 26362 accredited research panels managed by Qualtrics. The outcomes reported are the results from customers who have purchased and used house paint or stain in the last three years. In this case, 958 New Zealanders.